Tokyo/Singapore: Asian stocks rose, with the regional benchmark index on course for its biggest gain in almost five months, as China’s trade data beat estimates and investors speculated a bailout for Spain’s banks will help ease Europe’s debt crisis. China Cosco Holdings jumped 11 per cent in Hong Kong as China’s rising imports and exports boosted prospects for shipping lines. Canon, a camera maker that gets about 31 per cent of sales from Europe, rose 3.5 per cent in Tokyo. Sumco Corp. surged 14 per cent after the maker of silicon wafers for semiconductors posted operating profit that beat estimates. Gauges of volatility fell across the region. The MSCI Asia Pacific Index climbed 1.9 per cent to 113.59 at 5:45 p.m. in Tokyo, heading for its biggest advance since January 17. More than six stocks rose for each that fell in the measure. The gauge rose for the first time in six weeks last week as policy makers in the US, Europe and China signalled they would take steps to stimulate growth. 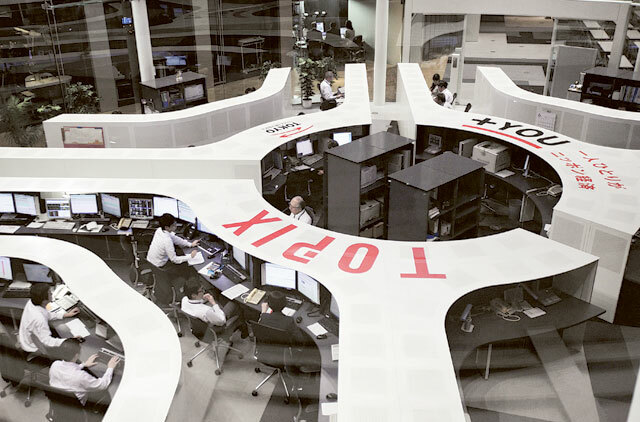 Japan’s Nikkei 225 Stock Average increased 2 per cent and South Korea’s Kospi Index rose 1.7 per cent. The Nikkei Volatility Index retreated 8.2 per cent, while the Kospi 200 Volatility Index sank 4.6 per cent. Australian markets were closed for a holiday. China’s Shanghai Composite Index added 1.1 per cent as the nation’s consumer prices increased the least in two years in May and industrial output and retail sales trailed estimates, adding pressure for more stimulus after the first interest-rate cut in three years. Hong Kong’s Hang Seng Index jumped 2.4 per cent, with the HSI Volatility Index sliding 8.9 per cent, the most since March 27. “Growth in China has slowed from last quarter but I think policy makers will ensure that more fiscal and monetary measures will be available in order to lift the economy back up again,” said Khiem Do, Hong Kong-based head of Asian multi-asset strategy at Baring Asset Management Asia Limited, which oversees about $10 billion. Chinese lenders and developers rose. Agricultural Bank of China, the world’s third-largest lender, gained 2.3 per cent to HK$3.11. China Overseas Land & Investment, the biggest mainland developer listed in Hong Kong, climbed 2.9 per cent to HK$16.92. The nation’s shipping companies gained as a separate government report showed China’s exports climbed 15.3 per cent in May to a record, exceeding all 29 estimates in a Bloomberg News survey. Imports rose 12.7 per cent compared with expectations for a 5.5 per cent gain. China Cosco, the world’s largest operator of dry-bulk ships, climbed 11 per cent to HK$3.84. China Shipping Container Lines Co., the country’s second-largest carrier of sea-cargo boxes, jumped 11 per cent to HK$1.93. Futures on the Standard & Poor’s 500 Index advanced 0.9 per cent today. The gauge added 0.8 per cent on June 8 on optimism that weekend discussions among European finance officials would result in a bailout for Spain. Companies linked to Europe gained after Spain requested as much as 100 billion euros ($125 billion) of bailout funds after weeks of escalating concern that bad loans at the nation’s banks might overwhelm public finances. Canon rose 3.5 per cent to 3,240 yen in Tokyo. Esprit Holdings Limited, a clothier that counts Europe as its biggest market, increased 6.7 per cent to HK$13.46 in Hong Kong. Hutchison Whampoa, which operates ports in Spain and Germany, added 3.1 per cent to HK$64.45. The MSCI Asia Pacific Index dropped 2.1 per cent this year through June 8, compared with a 5.4 per cent advance by the S&P 500 and a 1.1 per cent drop by the Stoxx Europe 600 Index. Stocks in the Asian benchmark are valued at 1.2 times book value, compared with 2.1 times for the S&P 500 and 1.3 times for the Stoxx 600, according to Bloomberg data. A number below one means companies can be bought for less than value of their assets. Sharp Corp., Japan’s biggest maker of liquid-crystal displays, advanced 8.2 per cent to 424 yen after saying Foxconn Technology Group’s flagship Hon Hai Precision Industry Co. will start buying from its TV panel unit three months earlier than planned. Foxconn is investing in the loss-making operation, which will be taken off Sharp’s balance sheet next month. Sumco gained 14 per cent to 790 yen. It reported operating profit of 2.9 billion yen ($36 million) for the three months through April 30, beating analysts’ estimates of 1 billion yen. Olam International jumped 8.3 per cent to S$1.76 in Singapore, heading for its biggest advance since October 27, after the commodity supplier announced a buyback of as much as 10 per cent of its outstanding shares.